I work in downtown Nashville so when I had a break, I decided to walk to the nearby Regions bank. The route I take is through an area called Printers Alley. 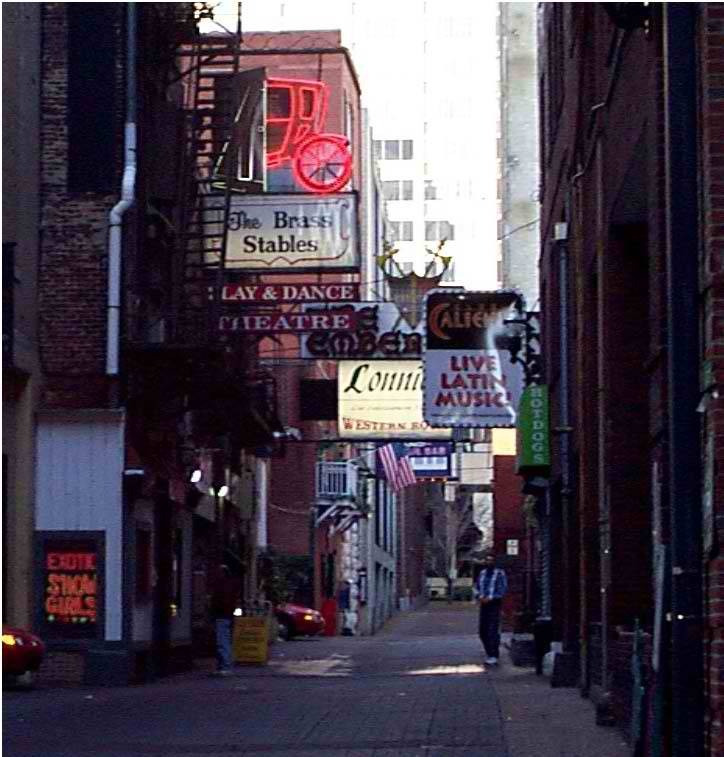 Lots of music history in Printer’s Alley, it’s been around since printing presses were all the rage, hence the name. So the alley is quite narrow, wide enough for one vehicle to drive through, but not two side by side. Off of the alley, there are a few gaps where storeowners or delivery vehicles can park for a short time, but even these gaps are one car wide. So as I made my way through alley, I approached a woman in her car trying to exit one of these side inlets. If you can imagine a car doing a 45-point turn, that’s what this was going to be. So being a good samaritan, I offered to help her, just doing the basics of telling her how far she could go forward till she needed to stop. She slowly approached the building in front of her and just before I gave her the halt signal, another woman came out of a nearby door and exclaimed “stop!” Totally understandable because from her vantage point she didn’t see me giving this girl directions. When she did, and learned I was helping, she was relieved and apologized. “Oh that’s fine, it’s great to have another set of eyes to help, so thank you so much!” is what I wish I would’ve said. Unfortunately, I said, “Oh, it’s ok. It’s better to have four eyes than two” to the woman who was wearing glasses. I walked away wondering what just happened. A few weeks ago I hosted my family in town. One of our favorite spots to go in Nashville is a great little restaurant called Pfunky Griddle. If you’re ever in town, I highly recommend it. Each table has it’s own griddle so you can make your own breakfast meal; the pancakes are delicious and so is the french toast. So anyway, we were there on a busy Sunday afternoon. The restaurant was once a home, so the old building has tight quarters with not much space to move around if you’re waiting to be seated. As we waited, my sister and I were chatting on either side of the narrow front register area. There was room for people to pass between us, and they did. As I was looking around the restaurant with nothing specific on my mind, my 10-year old niece walked in front of me on her way to stand by my parents. Without thinking I put my hands on her shoulders as she slowly passed by. I held on long enough to impede her progress so she looked up at me. I looked down, and you can probably guess what happened next. It wasn’t my niece. This girl’s face was washed over with confusion and fear. Instantly mine was, too. Somewhere nearby was a father with a clenched fist, I was sure of it. So this weekend I’m not going anywhere near narrow streets or hallways, people wearing glasses, or 10-year-old girls.